If you love enjoying the beach or outdoors, this product is for you. 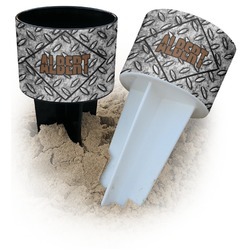 Tired of putting your beverage or personal items down in the sand or the dirt, just to pick it up again and get your hands all dirty? Fix it with our Beach Spiker Drink Holder! This special cup holder essentially has a huge stake on the bottom of it to anchor it to the sand or ground. A normal looking cup holder is on the top half and the stake is on the bottom half. The whole product is one piece that is made of a durable plastic that comes in a base color of either black or white. The diameter of the cup holder section of the Spiker is approximately 4 inches, while the height of the cup is 3 inches. This is the perfect size for most drinks or personal items, being large enough to hold a canned drink or even a cell phone with plenty of room to spare. The drink holder is 8 inches in its full height. Not only can you use this nifty cup holder at the beach, but when you go camping, have a picnic in the park, or even for squeezing between your couch cushions! Just take your Spiker Drink Holder and press it into the surface you wish to set your drink, speaker, phone, or suntan lotion! This really is the perfect way to keep your beverage and other personal items dirt or sand free. After use, easily rinse your drink holder off in the sink or wipe with a damp cloth, drying directly afterward. We reccomend handwashing (do not soak), but it is dishwasher safe. If put in the dishwasher repeatedly the image will fade and the label will wear more quickly than if it were to be handwashed. For personalizing, the choices are endless. You get to design exactly what goes on the specially sized and cut wrap-around label on your drink holder. Choose a combination of patterns, graphics, and colors that show off your personality! If you ever need help in our design center just give us a shout! We are always happy to help you achieve your designing dreams. Need a few more accessories for your day at the beach? Our personalized Acrylic Wine Tumblers are the perfect thing for a relaxing day in the sun. If you're not a wine drinker, try our customized Double Wall Tumblers!